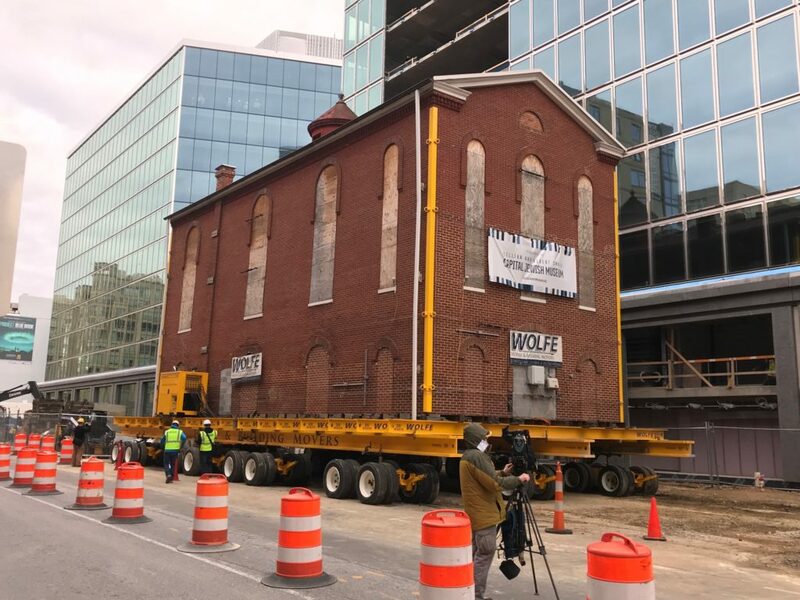 “Today, the oldest synagogue built in Washington was relocated to its permanent home at the southeast corner of 3rd and F St., NW – above a portion of the Capitol Crossing parking garage – where it will become a centerpiece of the new Lillian & Albert Small Capital Jewish Museum. The museum will sit across F St. from the historic Holy Rosary Church, which is part of the Capitol Crossing development. Since November of 2016, the 140-year-old building has been perched off of 3rd Street, NW, in anticipation of today’s journey. The museum will be home to new state-of-the-art facilities, including expanded exhibition, education and programmatic offerings, that will provide insight into the heritage of the Washington-area Jewish community. The historic building served as a synagogue until 1902, and later functioned as a Greek Orthodox church, bicycle shop, BBQ restaurant and grocery store. It was built in just three months at the corner of Sixth and G Streets, NW and was dedicated on June 9, 1876 with President Ulysses S. Grant in attendance. In the late 1960s, plans to build the Washington Metropolitan Area Transit Authority headquarters on the synagogue’s original lot sparked efforts to preserve and protect it. With help from the District of Columbia government, the Department of Housing and Urban Development, and an Act of Congress, the synagogue was relocated for the first time in 1969 to the northeast corner of Third and G streets, NW, which is now part of the Capitol Crossing development. Since then, it has functioned as a museum and educational facility for Jewish history in the greater Washington area.